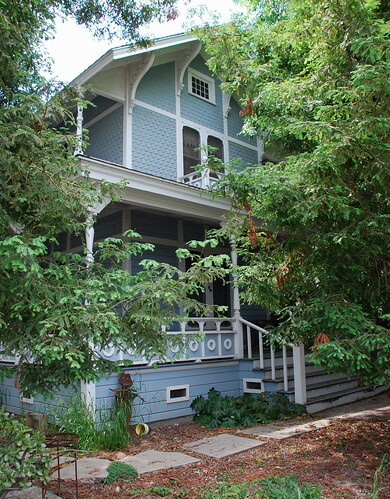 Moved a bunch of times over its 1.2 centuries of existence, the old James H. Dodson residence is now pretty much blotted out by trees, bushes, shrubs, and more trees. Some of its history is a little obscured, too. James Hillsey Dodson’s bio lists gigs in the building supplies and contracting business with his brother John and as a junior partner in the meat-packing firm of Vickery & Hinds. He was also a member of the San Pedro School Board, Director of the First National Bank, and San Pedro’s postmaster between 1893 and 1897. If that’s not enough, Dodson twice served as president of the San Pedro Board of Trustees, the precursor to the City Council. From 1930, that's James H. Dodson on the right. 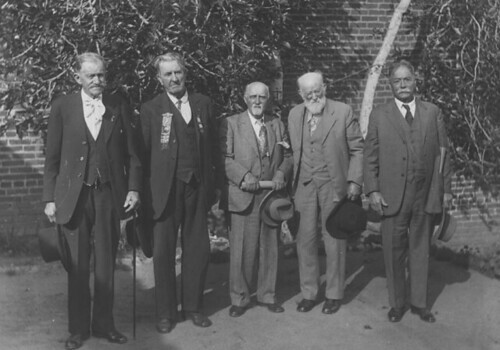 The quintet is clearly celebrating the birthday of Methuselah, standing next to Dodson. Photo from the L.A. Public Library. In any event, the home was built on Sepulveda property at the northwest corner of Beacon and 7th Streets on the edge of Vinegar Hill. 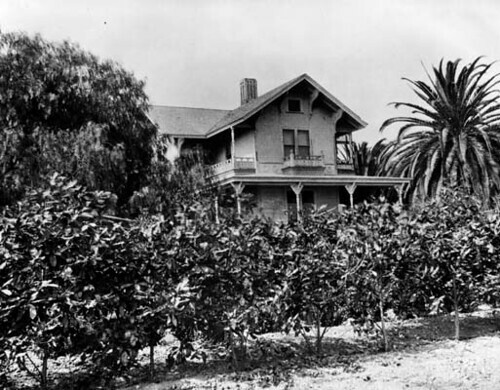 Just after the turn of the century, the Dodson Residence was moved to another plot of Sepulveda-owned land, roughly bounded from Leland to Meyler and from 15th to 17th Streets, school land today. 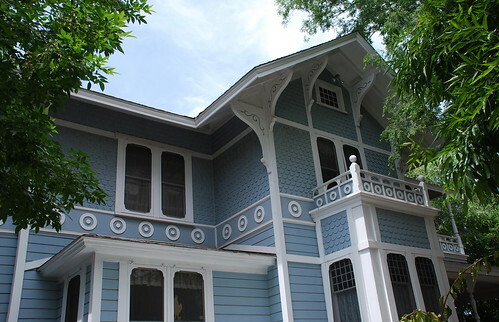 John and Betty Reed bought the house in 1954 and began a decades-long restoration of the old home. 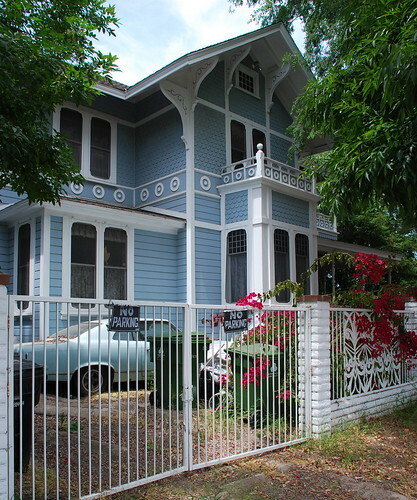 The grand Victorian remained in the Reed family as late as 1989. I don’t know who lives there now, but, whoever it is, they sure like shade. 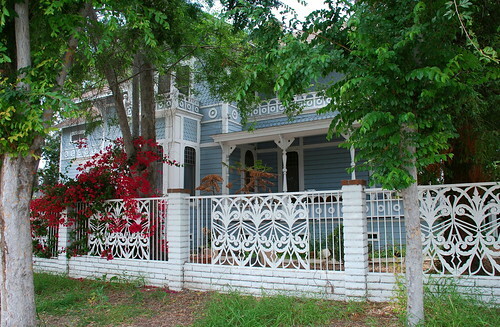 Is there not something on the preservation books that prevents the installation of that brick and ornate iron fencing? I think the former owners, the Reeds, might take offense to it as well (not to mention the abandoned cars parked in the yard). P.A., I'm not so sure the fencing wasn't from the Reed era. And my guess is the monument status wouldn't cover the grounds in this case. From what I've read, the house lost a lot of its ornamentation by the time the Reeds began their restoration. I was looking for something else, and stumbled on this site. I am Robert J. Reed, the second of three sons of John & Betty. 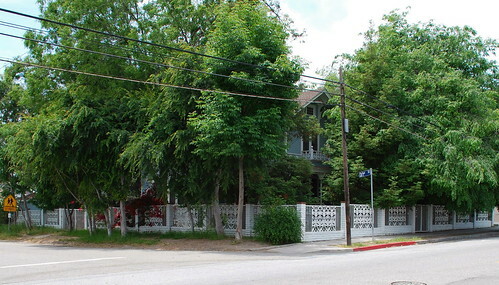 The Sepulveda-Dodson Residence has been the Reed family home since 1954 and is still with the family. The cars on the lot are not abandoned and are all in working order. There is a Classic Mercedes Benz, a British Taxicab (both mine), a Cadillac Limo (my father John's), and a collectable Rebel muscle car (my nephew Dustin's). The Fence was erected about 1979 from Art Deco ironwork salvaged from the remodeling of a furniture store on Pacific Avenue. The fence itself has a history to it. 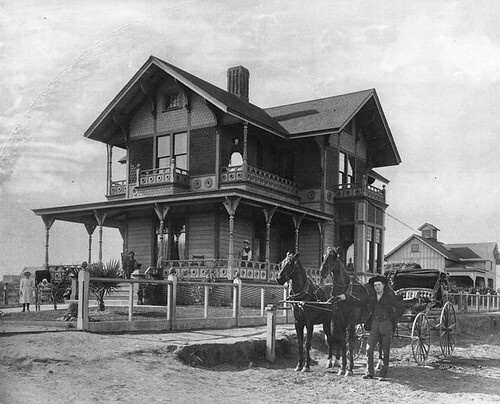 To add to or confirm the history written above, the house was built as a wedding present for Rudecinda and Mr. Dodson. There have been several dates attached to it in various sources such as 1885 and 1888. However, my mother Betty's research suggests that the house was built in 1882. It was moved 3 times. First from 7th & Beacon to the current location of San Pedro High School. Then from there to the current location of the Boys & Girls club, and finally, to it's present location. 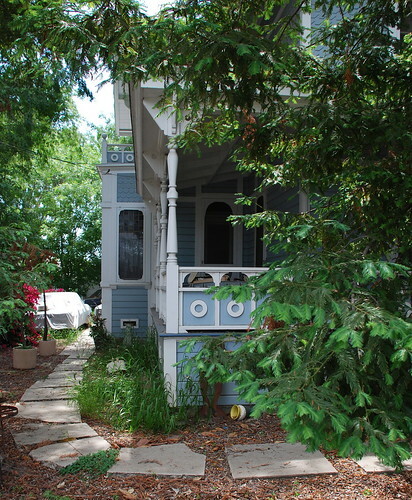 During its boarding house days, the house did loose some ornamentation and the front porch pillars, when the outside was covered with John Mansville siding and the front porch was glass enclosed. The house was restored about 1979 (same year the fence went up). Although there are now 12 rooms in the house, it was built with 10. The last two at the rear of the house, one downstairs and the other above it, were added in about the 1930's judging by the molding. They were probably added when moved to its present location and turned into the boarding house. The lot holds 19 trees: 3 California Redwood, 1 California Pepper, 2 Brazilian Pepper, 2 Avocado, 1 Zapata, 2 Rubber, 2 Ash, 6 Chinese Elm. It also had 2 Alder trees that died during a heat wave in the early 1980's. Yes, we do enjoy our shade, and on a hot summer day, there is always a cool breeze generated by these trees. If you look down upon the property from Virtual Earth, it appears to be an oasis in the asphalt jungle. Sometimes wildlife pass thru the property. I have sighted Fox Squirrels, Raccoons, and a Falcon (hoping to catch a Squirrel or Morning Dove). Although I have never seen one, I have also detected the visitation of a skunk. There is a canyon up the street between 13th and 12th. No doubt this is where the wildlife visit from. This may sound weird but, do you know how Rudecinda died? I don't know, Caro. She died on September 11, 1929, a month before turning 72. Family history suggests my great-uncle, James Aoysius Dodson,the youngest son John F. Dodson (brother of James H.)was born in the second floor,front bedroom of this house. My grandmother, Ynez Reyes Dodson-Hoefs(b.Jan.1899) records in her journal, written in the late 1970's, that she lived "up on the hill in the ranch house" with her parents and six younger siblings. Am not sure for how long they lived there, but I believe the ranch was in operation as she writes with a certain pride about her experience at cooking for ranch hands. She states that her little brother Jim was born when she was 17(1916)and she was given the honor of giving him his middle name. I would like to contact someone regarding this residence and other information to fill in some gaps of my researchof the Sepulvedas'. In summary, I am a descendent on my mother's side whose father, Peter Joseph Sepulveda (1880-1924) is through Pedro Alcantara Sepulveda, through Jose Enrique Anselmo Sepulveda, through Juan Jose Sepulveda (1764-1808), son of Francisco Xavier Sepulveda (1742 - 1788)and father to Jose Enrique Anselmo Sepulveda and Jose Delores Sepulveda. 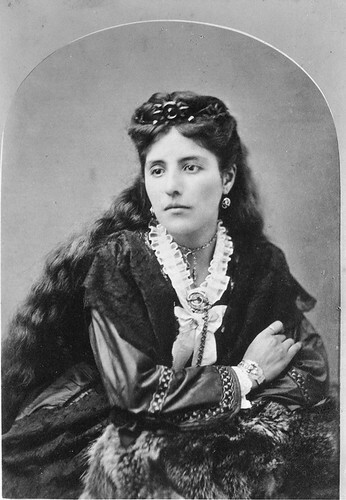 Through Jose Delores Sepulveda, his son Juan Diego Sepulveda came Maria Rudecinda (1862-1930). Sepulveda. I have been conducting research on my mother's side (we are the Seulveda Adobe in Malibu State Creek Park) and because I live in Rancho Palos Verdes I have been to the Dodson house, the ruins of the Royal Palms Hotel, the Sepulveda home in Torrance, and the Interpretive Center, as well as research from Rudecinda Lo Buglio, and making contacts to gather information on my side of the Sepulveda family. Although Juan Jose's descendants migrated eventually to the Santa Monica areas, my research on their settlement brings me to the PV/San Pedro areas where it brings me to follow up the beginnings. Would really like to meet someone or others that can help fill in those gaps. I was also at the Dodson house and the Harbor View Cemetery and heard the cemetery may be sold and possibly moved to Green Hills Cemetery. Please advise of any confirmation or "rumors" as I feel between the vandalism and lack of preserving our history on the hill, we lose many artifacts and history as these moves continue. I am prepared to purchse the Dodson home if Reed family interested as it is truly one of the last remains of our bloodline. As you know development is slowly eroding our rural country feel areas. I'm afraid to even ride my horse in the area of PV Drive North as the road is now like a freeway. Thank you for your time and correspondence. My grandfather and his family owned this house prior to the Reeds.